Discover the rural delights of the beautiful Southern Highlands with one of Golf & Tours Southern Highlands golf packages. From cool-climate wines and fresh seasonal produce to gorgeous gardens, spectacular waterfalls and wonderful national parks, there’s something for everyone. Enjoy idyllic walks in the fresh country air, visit cellar doors for wine tasting, and explore colonial heritage. With their golf courses set among lush greens and natural waterways, with abundant native wildlife inhabiting the courses and enchanting views over undulating fairways, you may find it difficult to concentrate on your next shot. To request a quote for your own bespoke and unique tour to the Southern Highlands, please complete the form below. We will be back in contact as soon as we receive your submission. Start packing your bags! Berrima Discover rich colonial heritage, including Georgian houses, a Regency courthouse and a convict-built pub. 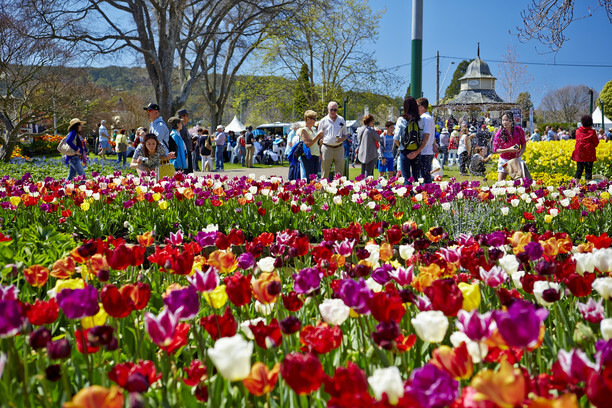 Bowral This charming escape entices with the Tulip Time Festival, beautiful parks and a famous cricket museum. Bundanoon A popular bushwalking and cycling destination on the edge of spectacular Morton National Park. Fitzroy Falls See the magnificent waterfall and amble on walking trails to lookouts with breathtaking views. Mittagong Enjoy wine tasting in pretty vineyards, colonial buildings, beautiful gardens and a lakeside picnic. Moss Vale Unwind and relax among rolling farmlands, vineyards, parks, and a nature reserve perfect for picnics. Robertson This postcard escape charms with escarpment rainforest, splendid waterfalls and spectacular lookouts. This is also were the movie Babe was filmed. Sutton Forest Stay in a heritage manor on a vast estate, enjoy idyllic walks in the fresh country air, and visit cellar doors.